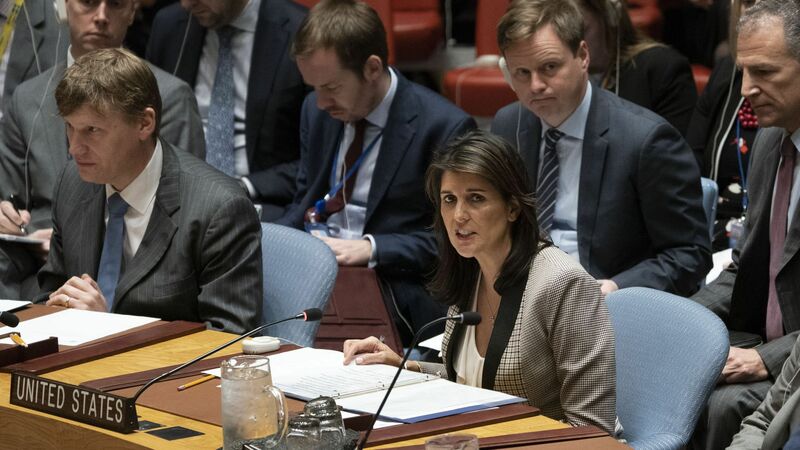 Outgoing UN Ambassador Nikki Haley has condemned Russia's decision to intercept, fire on and seize three Ukrainian navy vessels off the coast of Crimea yesterday as "arrogant" and an "outlaw act" that shows better relations between the U.S. and Russia are "impossible." Why it matters: Prior to Haley's remarks at an emergency UN Security Council session, the Trump administration had been almost entirely silent on the incident. John Herbst, a former U.S. ambassador to Ukraine now at the Atlantic Council, says if this "new, more dangerous form of aggression" goes unanswered, further Russian provocation is likely. Potential U.S. responses could include sanctions, or supplying Ukraine with additional weaponry. Shortly after Secretary of State Pompeo issued a lengthy statement condemning Russia’s “dangerous escalation" and called on Russia to "return to Ukraine its vessels and detained crew members, and to respect Ukraine’s sovereignty and territorial integrity within its internationally recognized borders." Pompeo added that the U.S. calls "on both parties to exercise restraint and abide by their international obligations and commitments." Editor's note: This story has been updated to reflect new statements from President Trump and Secretary of State Mike Pompeo.